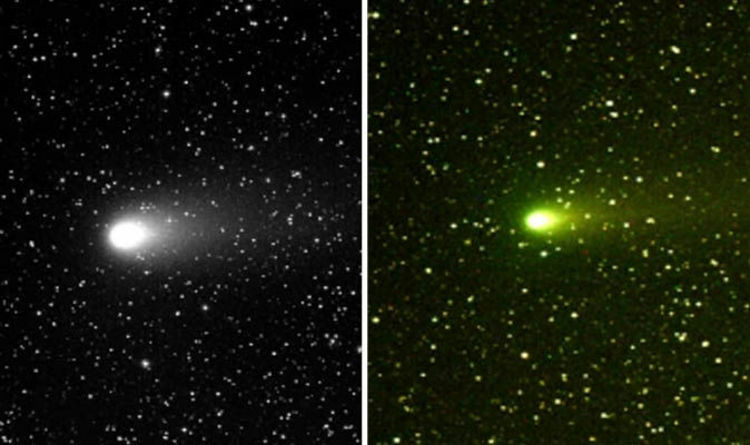 COMET 21P Giacobini–Zinner is poised to approach Earth early next week but astronomers have already observed the Green Comet light up in our skies – watch it here. The giant comet was spotted blazing a trail through the starlit skies late on Monday, September 3. If you are lucky, you might be able to spot Comet 21 over the following week as it nears both the Sun and the Earth. On the night of Monday, September 10, the comet’s characteristic green glow will brilliantly intensify in the Sun’s radiation. On that night, the comet will reach its closest orbital distance from Earth of about 36 million miles (57.9 million km). The Sun’s heat will ionise the comet’s icy surface, causing its so-called coma to look better than ever before. You can already get a good idea of what that will look like courtesy of robotic telescope service Slooh. Slooh tracked the comet’s journey through deep space last night, capturing a series of stunning snapshots of the Green Comet. Dr Paige Godfrey, a Slooh astronomer, said during 21P live stream the Green Comet is a periodic comet which orbits the Sun every 6.5 years. She said: “It comes about every six-and-a-half years – every 6.54 years – and that’s because it’s on an elliptical orbit around the Sun. “If our studio can bring up an image of its orbit, this comet is called a Jupiter family comet and that means that its orbit around the Sun takes it out towards Jupiter. “As it orbits around the Sun its orbit is elliptical and it goes through its perihelion, which is its closest point it is approaching now, and it goes to the nearest point to the Sun and then as it travels to the furthest point away from the Sun, called its aphelion, it’s out towards Jupiter. Comet 21P is estimated to measure somewhere around 1.24 miles across (2km) but it might appear much bigger in pictures and videos. This is because the ionised coma around the space rock gives it a bright halo of light. The comet’s actual nucleus of frozen ice and dust would not look too different from a star. Comet 21P was first spotted by astronomer Michel Giacobini, over Nice in France, who saw it pass through the constellation Aquarius on December 20, 19900. The comet was thereafter spotted once again by German astronomer Ernst Zinner two orbits later, on October 23, 1913. At it’s brightest, the comet can reach an apparent magnitude of 8 – anything below 6.5 magnitude is visible to the naked eye. This means the comet should be perfectly visible with a decent pair of binoculars or a telescope. Towards the end of the month, the comet will appear to move through the constellations Auriga, Gemini and Monoceros.